UD Professor Peter Williams, NA works in his studio in suburban Wilmington, Delaware. Peter Williams’ long and acclaimed career as an artist and an educator — recognized recently with his induction into the prestigious National Academy of Design — almost ended before it began. One night in the early 1970s, as an undergraduate art student at the University of New Mexico, a car in which Williams was a passenger plunged off a cliff from a steep, twisting road. He would spend most of the next year in the hospital, unable for months to use his hands or to see, while slowly recovering from injuries that included the amputation of his right leg. 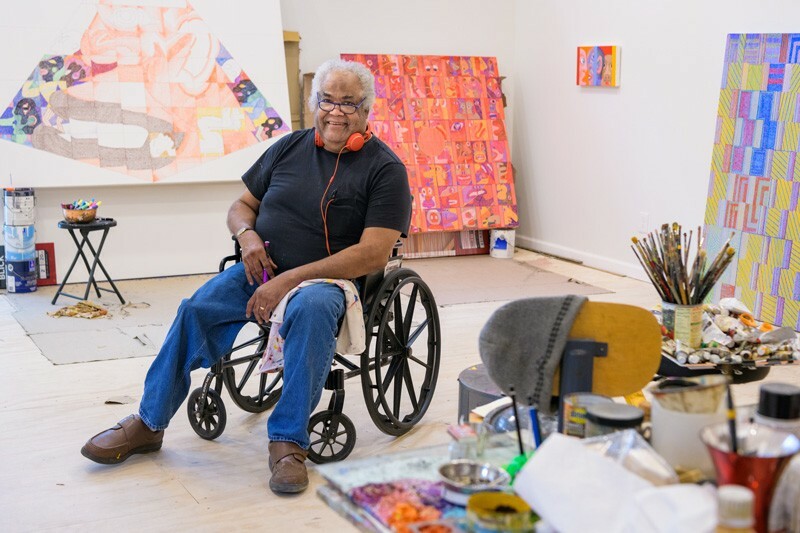 Now a professor of painting at the University of Delaware, Williams went on to earn bachelor’s and master’s degrees in fine arts and to teach for 17 years at Wayne State University, where he was described as a mainstay of the Detroit arts community. 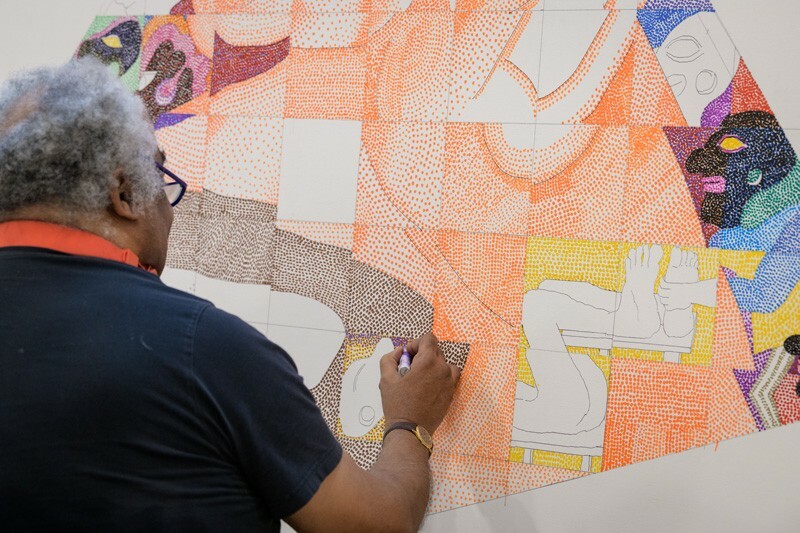 Peter Williams, NA fills in the outlines he’s drawn for a piece titled “Once We Built Pyramids,” referring to the ancient Nubian Dynasty in Africa. He uses thousands of brightly colored dots, creating a different look from the traditional pointillist painting technique pioneered by 19th century artists such as Georges Seurat. He joined UD’s Department of Art and Design as a full professor in 2004 and continues to teach painting and, occasionally, drawing classes. His own work has won numerous awards over the years and has always included themes of cultural identity and representations of African Americans. He has often inserted black characters and race-based imagery into his work, he said. Peter Williams uses different methods and tools for creating his art. That changed, he said, with the onset of the Black Lives Matter movement and other social-media-inspired attention being paid to the deaths of African Americans in police custody. At the same time, a growing awareness of racist incidents and policies, past and present, motivated him to do research into lesser-known aspects of American history, including lynching. In his use of narrative and story-telling in his art, Williams invented a superhero called “The N-Word” who saves the lives of African Americans as they engage with police. His recent work has also become much more directly connected to such social-justice issues as mass incarceration. Peter Williams, NA was inducted in November as a National Academician in the National Academy of Design, considered one of the highest honors in American art and architecture. 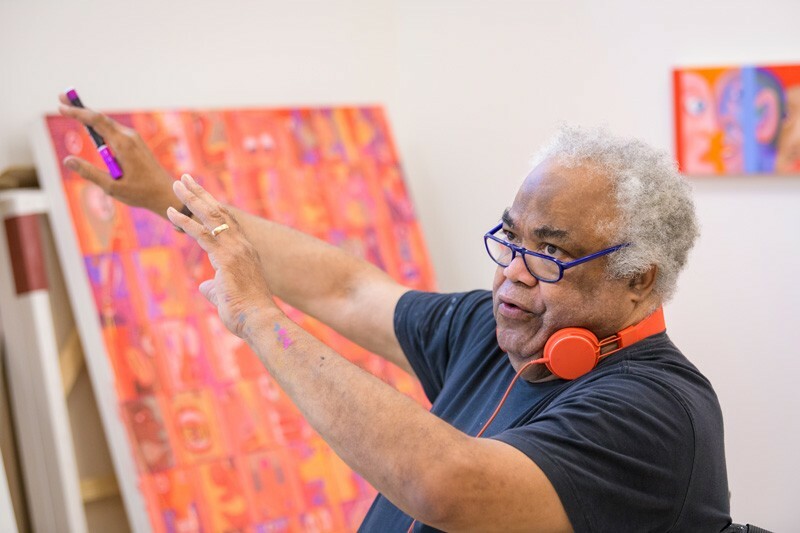 Williams said that, even though galleries sometimes “don’t know what to do with” his work and some urge him to tone down his depictions of racial cruelty, he hopes that most people are intrigued and moved by the powerful images he is painting. His work features bold colors and cartoonish caricatures that challenge viewers to think more deeply about the dark themes they represent. "I know that it can be painful for people to see, but I do think many people are enthusiastic because no one else is doing work that’s so blunt,” he said. Williams was inducted in November as a National Academician in the National Academy of Design, considered one of the highest honors in American art and architecture. National Academicians are chosen by their peers and serve as ambassadors for the arts in America. Williams’ art will be included in the National Academy Museum's collection of more than 7,700 works spanning nearly 200 years. His work is often featured in exhibitions, including the prestigious EXPO Chicago 2018, held Sept. 19-22, and his first solo show in Los Angeles, “River of Styx,” which opened in October and ran through Dec. 15 in the Luis De Jesus Gallery. Williams will be part of the upcoming exhibition “Men of Steel, Women of Wonder,” at the Crystal Bridges Museum of American Art in Bentonville, Arkansas, from Feb. 9 to April 22. Another recent exhibition, at the CUE Art Foundation in Manhattan, drew critical acclaim. “Peter Williams: With So Little to be Sure Of” was reviewed in the online arts magazine Hyperallergic by noted critic John Yau in March 2018. “Williams uses caricature to invite viewers — whatever their political persuasion — to reflect upon how they see people of a race different from their own, as well as underscore the intolerance, distrust, and fear running throughout our everyday lives,” Yau wrote. 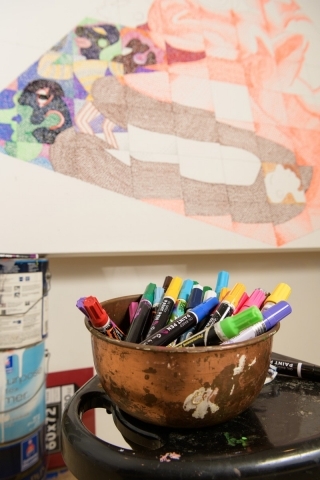 Williams has won numerous awards, including the Whitney Biennial in 2002, Djerassi Resident Artists Program in 2018, Joan Mitchell Award in 2004 and 2007, a Ford Foundation Fellowship in 1985-87 and the Wynn Newhouse Award in 2012. His work is included in such permanent collections as the Detroit Institute of Arts, Walker Art Center in Minneapolis, Whitney Museum of American Art, Delaware Art Museum and Howard University.